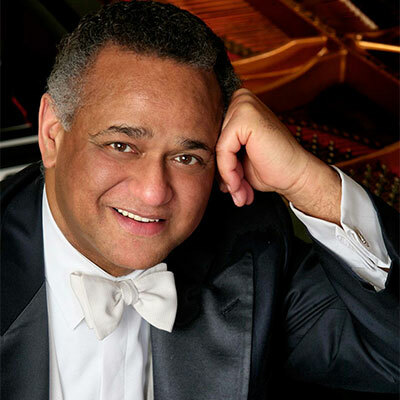 Andr� Watts is one of the world's leading piano soloists, bringing a marked lyrical quality to the standard piano repertory. He was born on the U.S. Army base in Nuremberg, part of the US Occupied Zone of Germany in the years following World War II. His father was an American soldier who had married a Hungarian woman. His mother gave Andr� his first piano lessons. When the family returned to the United States they settled in Philadelphia, where Andr� continued piano studies with Genia Robiner. At the age of nine he made his public debut in a children's concert playing Haydn's D Major Piano Concerto with the Philadelphia Orchestra. He continued studies at the Philadelphia Music Academy where his teachers were Doris Bawden and Clement Petrillo. Watts made his first appearance at a subscription concert of the Philadelphia Orchestra at the age of fourteen in C�sar Franck's Symphonic Variations. At the age of sixteen, LeRonard Bernstein asked him to appear on a New York Philharmonic Young People's Concert that was to be broadcast nationwide. Watts became a national sensation in the Liszt E Flat Concerto, which he played with complete technical mastery and self-assurance. Two weeks later, Glenn Gould was forced to cancel a regular subscription concert due to illness. As a last minute replacement, Bernstein called on Watts to return and play the same Liszt Concerto, which he did with considerable success. Watts then continued his schooling and piano training, choosing the great teacher and pianist Leon Fleischer as his mentor. Watts emerged a complete pianist and artist, with his technique polished of any insecurities, and the vision to form his own personal interpretations. This took place while building a career with appearances in London and at the Amsterdam Concertgebouw, and while completing a degree at the Peabody Conservatory in Baltimore. Watts made his Carnegie Hall solo debut in New York at the age of 20. He celebrated his twenty-first birthday playing Brahms' Second Piano Concerto with the Berlin Philharmonic. He returned to Nuremberg for a recital in 1970, where he was acclaimed as a returning native son. He became a top choice for important commemorative events, playing at a concert for Richard Nixon's first inauguration as President in 1969 and at the gala coronation of the Shah of Iran. He celebrated the twenty-fifth anniversary of his television debut with another live broadcast, this time on PBS with Zubin Mehta conducting. He not only played the same Liszt Concerto, but the second concertos of Rachmaninov and Beethoven as well. Watts specializes in the standard repertory from Beethoven through Rachmaninov, in addition to Mozart and Scarlatti. He won the 1988 Avery Fisher Prize, and at age twenty-six was the youngest person ever to receive an honorary doctorate from Yale University. He continues an active recording and touring career, including a Japanese tour and a trip to Hong Kong to play all five Beethoven concertos scheduled for the year 2000.